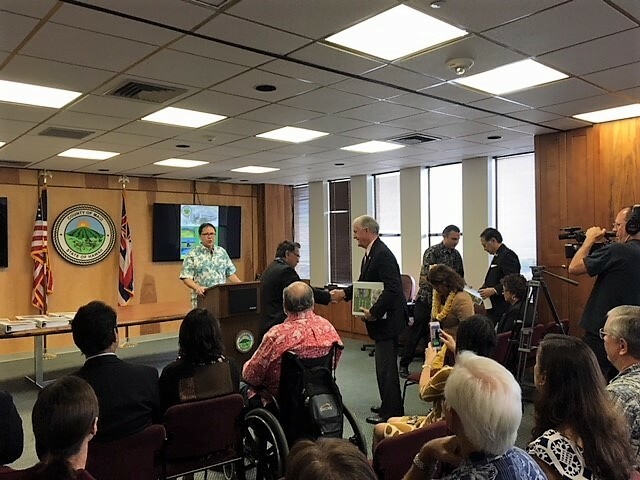 WAILUKU, Hawaii—The Maui County Council’s Budget and Finance Committee will hold evening meetings throughout the county, starting at the end of this month, to receive community input on the fiscal year 2019 budget, announced Councilmember Riki Hokama, who chairs the committee. Site inspections are scheduled for Monday, April 9, at 1 p.m. on Lanai and Monday, April 16, at 1 p.m. on Molokai. Agendas detailing site inspection information and locations can be found at MauiCounty.us/agendas. The council will also hold a public hearing on the proposed fiscal year 2019 budget on April 18 at 6 p.m., at the Council Chamber, 200 South High St., 8th floor, Wailuku. Committee members will begin reviewing the mayor’s proposed fiscal year 2019 budget, today, March 23. Committee meetings to discuss the budget will be scheduled starting on March 29 and continue throughout the month of April in the Council Chamber. The budget is the financial plan for the county for the upcoming fiscal year, from July 1, 2018 to June 30, 2019. It determines each department’s funding to carry out assigned duties, grants distributed to community organizations, and rates and fees the county may collect throughout the fiscal year. The budget also outlines the funding appropriations for the county’s capital improvement projects, which include road repair and maintenance, water system upgrades, and park improvements. Written and oral testimony will be accepted at all meetings. Written testimonies may also be emailed to bf.committee@mauicounty.us, referencing BF-1. Visit MauiCounty.us/2019budget for schedules, documents, agendas, announcements, and other information relating to the budget session. For special accommodations at any of the meetings, please call 270-7838 at least three days in advance.